The Bushnell Voyager Telescope has currently four models in the series. 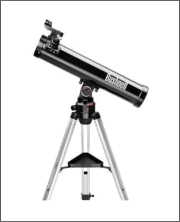 The 60mm and 70mm which are refractor scopes and the 76mm and 114mm, these are reflector scopes. The aperture of the 114mm is the highest to be found in this series and performs well in dim light conditions. The eyepieces supplied are 4mm, 8mm, 12.5mm with magnifications of 72, 113 and 226. The electronic Sky Tour handset provides a real time audio tour of the night sky, allowing you to discover constellations and some truly amazing facts, which will keep you enthralled for hours on end. The use of an Illuminated Smart Mount guides you to the objects highlighted by the Handset with an LED electronic red dot finderscope for fast positioning. This makes life so much easier and is a real time saver. 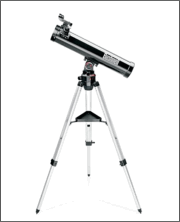 The voyager models come with 2 or 3 large 1.25" diameter telescope eyepieces depending on the model, and is of a sturdy construction making it a great first telescope. For fine, precise adjustment the Voyager telescope comes with an equatorial mount and has worm gears. There is also a counterbalance that gives a really smooth movement. You will find that at higher magnifications this is so important, particularly if you want to do some astrophotgraphy.